Back in 1994, before 3D games had taken off, a little UK-based games developer called Rare decided that if it couldn’t have good looking 3D models in a game, it'd have to get creative. 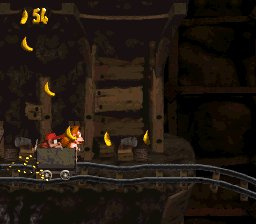 Donkey Kong Country used a pioneering new technique for the time that took images of pre-rendered three dimensional models and turned these snapshots into frames for typical 2D sprite animation, resulting in one of the best visual treats available on the SNES. That’s the part of Donkey Kong Country that will survive throughout history, but like so many other things, you don’t measure fun in polygons. 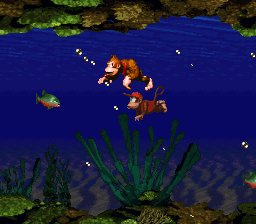 Donkey Kong Country was just one of the dozens of great 2D platforming games that were prevalent throughout the late eighties and early nineties, but although the visuals were the hook for many hungry gamers, it was the gameplay that kept them interested; this holds up to today’s standards better than even some of the more iconic titles of the time. The controls are incredibly tight and responsive, every moment you make feels precise and calculated. Even using the control stick on this Virtual Console version feels natural and effortless, especially when compared to some other titles where you need to use the D-Pad for optimal control over your character. It uses the classic trope from the Mario series wherein the run button also functions as the button used to pick up items, but the items you can pick up are never placed in a position where your chances for survival are affected by doing so. The controls are so well refined that they’re comparable to the latest title in the series, Donkey Kong Country: Tropical Freeze. The basic gameplay revolves around the Donkey Kong we know today (grandson of the original Donkey Kong from the arcade game of the same name) on a quest to retrieve his banana horde that was stolen by the evil King K. Rool and his army of Kremlings. Our hero isn’t alone though, his nephew Diddy Kong is along for the ride as well — tagging along behind his uncle — but despite his size he’s just as capable an adventurer. You can also switch between the two Kongs at any time in order to take advantage of Diddy’s speed and higher jumps or Donkey’s strength and more powerful attacks. 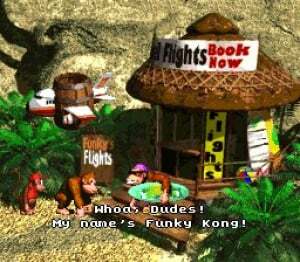 You’ll require the help of some other members of the Kong family as well; Candy Kong provides you with a location to save your data, Funky Kong allows you to travel between areas, and Cranky Kong (the aged form of the original Donkey Kong) sometimes provides you with hints about the game, but often just complains about how rotten everything is in his eyes. The level design in this title is utterly superb. Every level has little nooks and crannies hiding secret areas where you can try and earn some more bananas or an extra life, and there’s no indicator to show where they are, meaning that you’re going to have to scour each level thoroughly to find all of them. This would usually be a problem, but given that there’s never any necessity to visit any of these locations means that even if you don’t manage to find any in a level you’re not really missing out on anything more than a few bonus items. It’s best to try and keep a healthy curiosity for these areas, but try not to become obsessed, as Rare managed to hide many of them so well you may never find them. Don’t expect the same level style every time you enter a new world, either — each level has its own unique blend of gameplay mechanics, be it rope-swinging, deep-sea diving, blasting between barrels or charging underground on a mine cart, you’ll never feel like you’re repeating any experience. You’ll also have to have your wits about you, as the game is not one that’s especially easy to pick up and play; differently functioning enemies will spring towards you without any warning, so you’ll have to be alert every time you enter a new level. Does the sometime cruel difficulty sour the experience? Not at all, the trial-and error frustration only adds to the determination you’ll feel to get through that one level that’s been driving you mad for the past half an hour, and the euphoria once you complete it is all the sweeter for the torment. Scattered throughout some of the levels are a number of helpful animal friends that strive to help Donkey and Diddy in their endeavours, and these critters also help to really vary the gameplay. They’re always completely optional though, so if you don’t want to dive into an entirely new style of play at the risk of losing one of your precious lives – which are indeed precious in this game towards the latter half – you can always just ignore them and continue as you were. You’re likely to miss out on a few extra goodies, but sometimes you’ve got to play it safe to get to the end of a troublesome level. The only real downfall of Donkey Kong Country is the boss battles; whilst not explicitly bad, they really do pale in comparison to the rest of the game, which is a tremendous shame. These enormous enemies have very basic attack patterns that while not necessarily easy in all cases, are repetitive and uninspired. The bosses themselves are nicely designed and pretty to look at, but fighting them can become a bit tiresome after a while. If you’re wondering whether or not to buy Donkey Kong Country, just buy it. It’s a game that should be on every Wii U console, it’s as simple as that. It’s not a perfect game, but considering that it came out twenty years ago it’s still better than even many of the best games on the Virtual Console at the moment. Long, engaging and never boring – except with some of the boss fights – Donkey Kong Country is an absolute must-buy for anyone who hasn’t played it, and even those that have, as it’s a perfect port of the original. One of my favorite games on the SNES. When it hit the VC on Wii I quickly picked it up. Something about this game always draws me to it, must be the music. Masterpiece of its generation. Good and balanced gameplay, top notch level design and an awesome soundtrack by David Wise. Got it on the Wii, great game. Such an awesome trilogy, or bi-trilogy counting the excellent GB games. I hope this comes to NA sooner rather then later. It is one of my SNES games. Great review. I really hope this hits the US E-shop. I'd pay tens of dollars to replay this trilogy again. @Kaze_Memaryu maybe you don't like good games? Absolutely cannot wait for the US release.. Hopefully next month to celebrate the series' 20th anniversary! Have to agree on the bosses being somewhat lacklustre, but this will always be a 10/10 in my book. Still remember getting the console and game bundled in a beautiful box, totally awestruck. And then of course enjoying the game for years. This is definently something I can see BA taking forever to release, Id like to experience this 'classic' just like the others of Super Mario World and Earthbound. November or December for American eShop? 9 seems about right for this one and DKC3. DKC2 is nothing less than a perfect 10, in my opinion. The SNES DKC trilogy is the best gaming trilogy I can think of. The excellent core gameplay is fairly consistent throughout all three games, but the atmosphere and setting varies tremendously and to great effect. Probably the most overrated game ever. @Ryno Yeah, one of 'em probably. This and Super Mario Kart. Honestly, DKCR and Tropical Freeze are way better. This one's good though. This game was really difficult for me when I first played it. 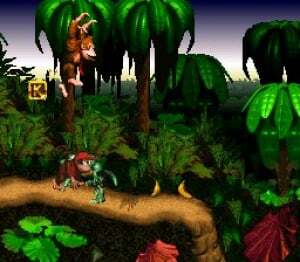 I was quite young but I remember the secret Orangatang level and Tree Tops were both nightmares to complete! I still prefer DK2 over this one. I hated how this one reused the bosses, with a little twist to make them harder, and said bosses were little more than small enemies blown up to make them bigger and menacing. Never saw what people raved about in this. Was wowed by the graphics when it came out, but after I played it I just found it tedious and not a patch on Super Mario World. Was always underwhelmed by it. Rare didn't earn a special place in my heart until I played Goldeneye and Banjo Kazooie. I'd rate it 5 or 6 myself. The donkey Kong country games are among my favourite platformers. @minotaurgamer Well, I can say there are more games than Donkey Kong which I think of as good, but still don't like. But looking at the video, I think I just hate the visuals... and monkeys aren't my thing, either. If it had Super Mario World quality graphics, it wouldn't have done so well. Its a good game but the graphics and music are its only stand out features. I think it was Super Play who said something like "you have many games like this already but here's one pretty graphics". They also pointed out that Nintendo didn't trust Rare with Mario and gave them a character who hasn't had a new game in ten years to play with instead. Once this game is available I will be immediately upgrading my Wii version to the E-Shop version! I also feel that Aquatic Ambiance is one of those tracks that takes you back to simpler times, and I didn't even have a Super NES as a kid! It's a very solid platform game but to me it doesn't hold up as well as the very best of the best 2D platformers like Super Mario Bros 3 (specifically the Super Mario All-Stars version), Super Mario World and Yoshi's Island imo. @Bass_X0 It was one of the few PAL games done properly that is why people in the UK liked it at the time. (Or at least part of it). Like I said before, does it need to be said that the game looks absolutely gorgeous on the gamepad ? And in my opinion, this game deserves a 10. I have such memories of the days trying to hit the 101% secrets ! And replaying it today, I realise that this is not just nostalgia speaking. Donkey Kong Country still rocks !! 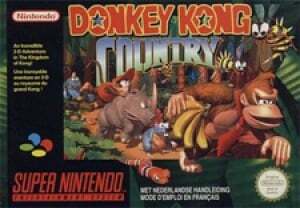 DKC will always be a testament of the "console wars" of the 90's It stands like a monolith in time, proof of how ageless games can be and how Nintendo claimed victory over the 16 bit market and managed to keep the SNES alive for 4 more years against CD based consoles like PS1 and the Saturn. I dont know am I the only one that thinks that this game is overhyped? I mean dont get me wrong the levels are great music controls etc but I dont think its that much better then say Super Mario World. One of the few games where the sequels are actually as good or even better than the original! DKC 1 is just a bit too difficult in parts IMHO; DKC 2 is better but DKC 3 gets everything exactly right. I still remember simply hating this series back in the day and, well, i adore it today. And i dont even know why. Its brutally hard, sports some really annoying features (its save and world travel for instance) and yet, i always come back. I like this game quite a bit, but it's my least favorite of the trilogy. It's fun, but I like the more complex levels from the other two better. To me this one is a 8, DKC2 is a 10 and DKC3 is a 9. A few people have comment that this game is overrated/overhyped. Not a popular opinion... but I totally feel the same way. It looked good (back in the day) but I've never understood why people felt the controls or level design were that good. Neither compare to a Mario platformer, for example. Maybe that's not a fair comparison since Mario pretty much sets the bar, but since it comes from the same publisher on the same platform it's impossible to ignore how much tighter and more creative one series is compared to the others. That said, I did enjoy the sequels more than the original and the recent Wii/Wii U updates are pretty decent games. Nowhere near a 9/10 for me personally, but worth trying I guess. The first DKC is admittedly relatively simple, but the same can't be said for DKC2 and 3. Those games are just as nuanced from a gameplay perspective as any of the 2D Marios, if not moreso, and have level design that's second to none. Not one of the best games of its generation, but one of the most significant and influential from what I can tell. The level designs aren't all that inspired and the bosses are far less so, but the foundation was laid and the game left its mark. Now, this game itself may not be a masterpiece of creative platform game design, but its first sequel is certainly up there. Really, Diddy's Kong Quest deserves all the praise that this game gets. I understand that this game is a little overrated, but anyone who claims that the whole series is is wrong. Aww, much nostalgia here to be sure, but it belies a significantly flawed game whose difficulty is more often tied to unfair, rather than challenging level design. It's weird to see there are still people who think the DKC series' most efficacious property are the graphics, but in the case of the first game, they do sort of have a point. DKC2 has it beat in every which way. It's a good game, but I disagree with the 'hasn't aged a day' tagline....I think it's aged much worse than the other 2 DKC games. There's a distinct lack of variety in the stages, a couple of very bland stage designs, the boss fights are pretty dull and extremely unimaginative and quite a few of the bonus level barrels are absurdly difficult to find without leaps of faith or just plain dumb luck....the music is great though and it plays really well, I've always liked that there's pretty much zero powerups asides from the animal buddies and it relies on your basic skills a lot more than most games. It laid a solid foundation for the (much better) sequels too so I don't hate it but it's only an 8/10 for me. If this trilogy doesn't come to NA, I will seriously import a second Wii U from Britain just to play these games on the gamepad with virtual saves. That's why I love Tropical freeze so much. Well, not to say I don't love DKC Returns too, but TF has that whole "ship on an island thing" and like DKC2, it's a glorious game. Wasnt this pulled off form the VC? @Gridatttack Yes, from the Wii Eshop and they are now coming back on the Wii U Eshop (part three releasing next week). Nope. The mine carts and rocket barrels in Returns and Tropical Freeze are much, much harder. Are you referring to Stop N Go as the mine level? Go back through the entrance for a shortcut to the end. I still remember that Christmas morning, so long ago. Good times. I never experienced DKC back in the days, but I bought this on the eShop based on the high praise from others. To me, this is a dated and overrated game, as a game in itself. But it's interesting as a history lesson to see where it all started. DKC2 is a huge improvement, IMO. Nevertheless, I'll buy the 3rd as well on the eShop, just to have the trilogy. It makes me appreciate Tropical Freeze even more. I bought all 3 for the SNES back in 2012 for $9.99 each and I don't see why people call them classics. DKC2 has good music, but the gameplay's vertical scrolling levels slow the game down and DKC3's characters are rather lackluster. DKC is the only game with cool characters, beautiful music, and is great for speed running. It's the only one I kept for my SNES. I might download it anyway since I never bought it on the original Wii. @minotaurgamer - Maybe people have different tastes and no game is for everyone? Really hope this comes to the US sooner rather than later! If it makes it to NA, I'll buy it. I've wanted to play DKC again since I finished Tropical Freeze. Didn't think this game was as mindblowing as everyone seems to always say it is. It's okay, but it doesn't hold my interest the same way a good Super Mario Bros game does. Donkey Kong Country is an awesome game. I could really use the Wii-U transfer, because certain areas are a PITA without save states. Honestly I'm surprized they brought it back. Shortly before Wii-U came out, they pulled it from Wii Shop. I'm surprised how many people are bothering to say how they think this game is overrated. I think that might be because of the fanboy in them remembering that Miyamoto didn't like the series. It wasn't massively original but it refined and beautified most of the staples of 16-bit platforming. I remember Christmas 94 being perfect because of this game. It also makes me proud that I didn't consider it a difficult game to complete when I was 12 but it's considered really tough by modern gaming standards. I don't think the graphics hold up too well in any of the SNES DKC games on my 50" tv but they look ok on the gamepad which is where I will be playing them. One of my favorite games on the SNES, and a example to how awesome RARE was back in its hey days! Do people really consider DKC trilogy hard? Maybe I've played those games too much, or maybe it's because the controls and play mechanics are so great. Doing a barrel roll and then jumping in the air is a great mechanic and makes speedrunning fun. This game and it's sequels are not overrated at all. More important than graphics for me are the controls and soundtrack. It still looks nice today though. Well it has finally arrived in NA wii u eshop so now Na wii u owners can celebrate but this is a great review.